All of our projects have unique challenges that we enjoy, but this particular vehicle wrap was just plain fun! Everyone at the shop was talking about how great the cab looked once we were done, and the owner loved the final result. Bill Schoneberger of Clear Concepts Communication did the design for the wave and overall layout, based on the artwork of Tomac Henson of Epik Ink Tattoo. 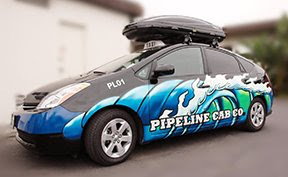 We tweaked the design to fit the Prius, and created separate cut files for the two layers of vinyl lettering. 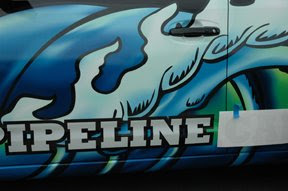 The first layer of cut vinyl was the black background for "Pipeline Cab Co.", followed by white reflective vinyl to make sure the cab name is visible at night.